Why solar light need circuit? This voltage is passed to the LED and light is produced. The short pulses of energy delivered to the LED occupy about 20% of the total time but the energy they deliver produces a light-output equal to a constant DC voltage. By delivering short pulses, only about 30% of the energy is needed to produce the same illumination as a constant voltage. The circuit only needs the first two transistors to create an oscillator. 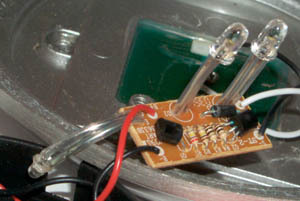 The circuit turns on when the photo resistor fails to detect light and its resistance effectively goes very high. This allows the 47k base resistor to turn on the transistor. The voltage rises on the base as the 100n charges and the transistor turns on. This occurs when the the first two transistors turn on as the emitter-follower third transistor is also turned on during this action. The 330p is pulled low during this action and it quickly charges. When it becomes charged, the "turn-on" current for the BC 557 is reduced and it turns off slightly. In the first instance, the voltage on the top of the inductor was more-positive than the voltage on the lead connected to the collector. When the current is reduced, the voltage collapses and produces a voltage that is negative at the top lead and positive at the lead connected to the collector. This is exactly the same as connecting a battery to the positive rail of the project with its negative on the top rail and positive to the collector. This produces a very high voltage on the collector of the transistor and is passed to the base of the BC 557 via the 330p. The BC 557 is effectively turned off completely. The result is the first two transistor are fully turned off and the third transistor is also fully tuned off. You cannot measure this voltage with a multimeter as the voltage is produced in the form of spikes. If you remove the LED, a CRO will show the spikes are higher than 40v. They are accent type lights that gather the sun's energy during the day and store it in batteries to be converted into light at night. How do solar lights store energy and how do they work? The lights have a built in solar panel and charging circuit which renews the energy in the rechargeable batteries in much the same manner as a rechargeable flashlight operates except the sun provides the needed electrical energy rather than plugging the unit into an outlet. How do you turn solar lights on? They turn on and off automatically. When it starts to get dark the specially designed circuitry turns the light on and it stays on until the battery is discharged or daylight reappears. 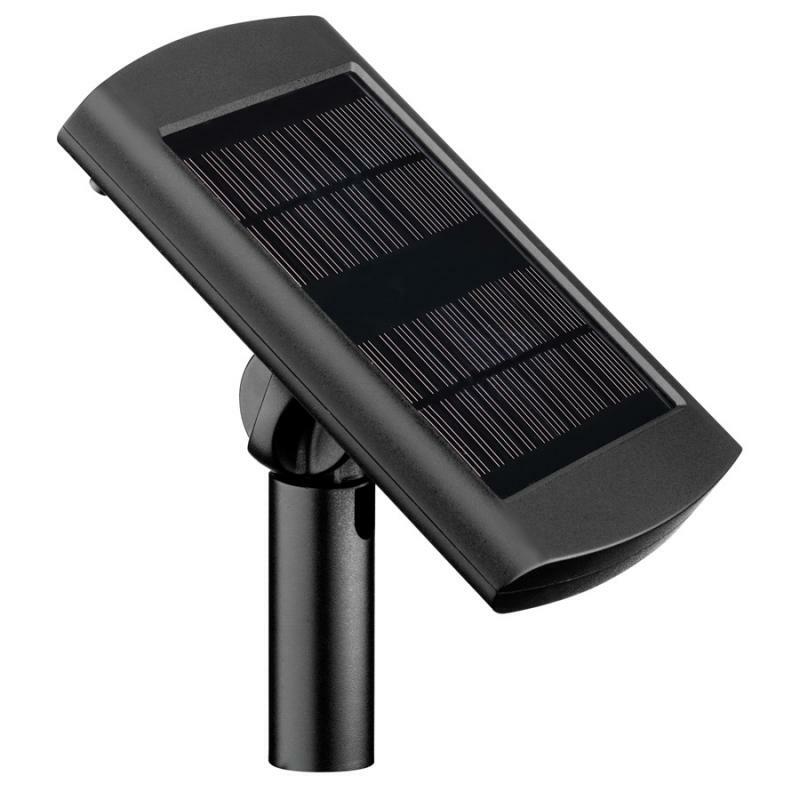 "Malibu" solar lights do not utilize photo eye controls which are prone to failure in solar lighting applications. What advantages do solar lights offer? They require no wiring, are very easy to install, and run off the sun's energy. Solar lights sound too good to be true... Are there any disadvantages? There are some disadvantages associated with solar lighting so it is important to acquaint yourself with those limitations, as reviewed below, to avoid any disappointment. What are disadvantages associated with solar lighting? First, by all definition solar lights must have sun during the day to charge the batteries. The length of time that the lights stay on at night are in direct proportion to the amount of sun exposure during the day. Very simply, the better the sun exposure during the day the longer the lights stay on at night. Also, it is important to realize that the fixtures need to be positioned so that the solar panel is exposed to the sun... overhanging trees, shrubbery, your house, shadows, etc. are all potential limiting factors to optimum performance. Is lower light output considered a disadvantage? 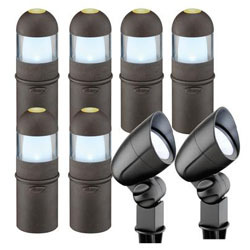 The lights are usually not as bright as most other forms of outdoor landscape lighting. Some people feel that this is a disadvantage, however, others welcome the softer more subtle light output that these fixtures were specifically designed for. I live in an area that has sunny summers but harsh winters with very little sun. Do solar lights make sense for me? While the fixtures themselves are designed for use in most weather conditions the on times can be adversely affected in the winter. Because they install so easily many people store them in the fall and simply put them out again in the spring. Realistically, what can I expect from solar accent lighting? When the sun cooperates you can enjoy lights that are ideal for many applications, especially those where accent lighting is desired and it is inconvenient to use hard wired type products. What sort of maintenance will I need to be concerned with? Other than replacing the batteries there is not really much that can go wrong from a functioning standpoint. How often do batteries need replacing? The batteries are designed to withstand a minimum of 1000 deep discharges which is at least 1000 nights of light. In reality they should not have to be replaced for at least 3 years. What else should I know about the batteries? These easily replaceable AA NiMH (Nickel-metal hydride) rechargeable batteries are available at your local battery retailer. Be sure to purchase replacement batteries with the same, or higher capacity. Battery capacity is rated in milliamps (mAh) and is printed on the side of the battery. Do I need a battery charger for my new NiMH batteries? No. NiMH batteries will be charged in your solar fixture by the sun. What type of light bulb is used in solar lights? Solar products can use a variety of light sources but the most popular fixtures utilize LED's (Light Emitting Diodes) because of their dependability and low power consumption. Up until recently LED's where only available in red, green, blue, and amber with amber being the most popular choice for outdoor lighting. Recent technological advances have made it possible to utilize LED's which produce a white light and they are growing in popularity especially in some of the upgraded metal solar fixtures that are now available. How often will I need to replace the LED in my solar fixture? The LED's themselves are not replaceable, but their life expectancy would typically exceed 25 years based on running 10 hours every night. What's the main reason Malaysian choose solar light for their garden? Good return of investment (ROI)! To do wiring in a small garden may cost you few thousands Ringgit Malaysia, but with small portion of that money, likewise RM1,000, you can purchase 3 packages of SC413 which consist of 9 units of solar spotlight. This is adquate to light up a small garden. Not to mention you also save on purchase wire spotlight, maintenance for light bulbs, and no electrical bill to pay to light up your garden at night because it is solar power!